Anyone who knows me well knows that I have always been a fanatical Brady fan. In college, I took great pride in impressing my floormates with the most obscure Brady trivia, and took any possible opportunity to convey the extent of my all-consuming Brady obsession. I can't look at applesauce without blurting out "Porkchops and Applesauce" in the voice of Peter as Humphrey Bogart, and I can't count the times I've admonished my oldest son: "mom always said don't play ball in the house!" I may have been an expert on Brady minutiae, but I certainly was not unusual in my cult-like worship of the program. 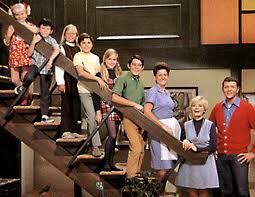 The Brady Bunch was one of the first prime-time network shows to be syndicated nationally during after-school hours. During the mid-late 1970's, almost every elementary schoolkid in America came home every day to watch an hour of the Bunch. The show's warm, fuzzy vibe and innocuous plots combined with the relief of being released from the drudgery of spelling tests and dittoes (remember them) to create an hour of daily utopia. I've read many accounts of kids who grew up in troubled homes, and wishing they could live at 4222 Clinton Way. And even for those of us with happy childhoods, it was easy to get caught up in the fantasy world of silly problems that were solved in 20 minutes. But over the years, I started to lose touch with the show. In the rear-view mirror of my memory, the show began to appear corny - a colorful, dated relic of the "groovy," "far-out" early 70s. In the cynical 90's and 2000s, it became easier and more fashionable to make fun of the show, laughing at it rather than with it. 1995's "The Brady Bunch Movie," while really funny and terrific in its own right, reminded all of us just how out of touch with reality the Bradys - and by extension, their die-hard fans - were. 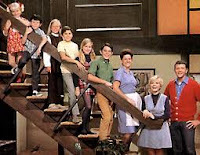 Just a few months ago, I admitted to a friend that the Partridge Family was actually superior to the Brady Bunch - it was edgier, funnier, and more sophisticated went my argument. But during the week after Christmas this year, Walmart was running a special sale on Brady Bunch DVD's. For just over 5$ a season, I thought it would be worth reliving some of the childhood nostalgia, although my expectations weren't too high. I figured they'd be good for a viewing or two, and for a few laughs at the show's expense. Two months later, though, I'm still watching the DVDs every day! My family and I have been through the entire series several times now. Not only has the show retained every bit of its after-school charm, but I was actually amazed to discover that it's also a good show. Sure, the plots are a little bit silly - but those kids can act! Or maybe it's not that they are even acting; maybe they were just very well-cast kids being themselves and having fun in the process. But whatever the case, somehow the Brady Bunch, against all reasonable odds, gets you to suspend belief for twenty-four minutes, and to accept that patchwork family as real. 2) Alice was genuinely funny. Ann B. Davis made some terrific faces. It's like watching a skilled vaudevillian actress - every facial muscle is constantly acting and reacting. Sure, here jokes are hokey, but they fit the character, and Davis' hard work and artistry help to turn the corn into actual humor. 3) The soundtrack music was like an extra character on the show. There seemed to exist dozens of variations on the main theme...clunky, slunky, mischievous, serene, bright, groovy! On the DVD pilot commentary, Sherwood Schwartz mentioned that music director Frank DeVol could "make the music do anything." Watch just one or two episodes, and you'll see that he's absolutely right. 1) The show takes a laughably generic approach to pop/rock music! Greg is all bummed out when he gets grounded and can't take Rachel to "the rock concert." Whenever the kids listen to "groovy music" on their huge AM radios, you can hear what sounds like the Dating Game theme blasting out. When Greg becomes Johnny Bravo, his agent works for "Big Hit Management Company." And Davy Jones is portrayed by Bobby and Peter as a guitar-wielding rock god. I think I love your voice most; it's an inviting and the expression is so honest. I also remember the Brady Bunch as a young person after school away from "dittos" Yes, remember those silly fill in the blank things that were forgotten the minute you completed them. Thanks for the memories Dan!